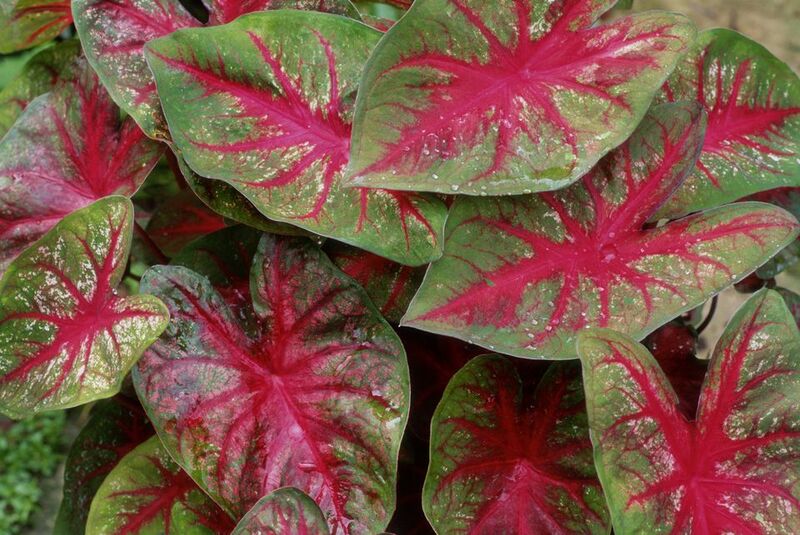 Caladiums are tuberous tropical plants that are grown for their spectacularly colorful foliage. Although tropical, they grow fast enough to be enjoyed as annuals during the summer in cooler climates and all year long as houseplants. Caladiums thrive in warm, humid shade, and dazzle in shade gardens with their large pointed arrow-shaped leaves splashed with shades of green, white, cream, pink and red. Although they don't usually flower when grown as annuals, the foliage puts on a dazzling show all season with minimal fuss or care. A Word of Caution: Caladiums can be a skin irritant and are poisonous if ingested. Caladiums are only perennial in USDA Hardiness Zones 9 - 11. However, they can be grown as annuals or overwintered as tender bulbs. In cooler climates, it helps to give them a headstart by potting them up a month or so before your last frost date, so they will be up and growing when it is time to plant them outdoors. Most Caladium varieties grow to about 18 - 24 inches tall, however, there are some dwarf varieties that peak at 8 -12 inches. The width of your plant will vary with cultivar and age. Caladiums grown as annuals and stored as tubers during the winter will not get as lush as caladium plants left in the ground or grown as houseplants. Caladiums do not do well in full sun, which can burn their leaves. Give them a spot in partial to full shade where they will provide flashes of color without having to worry about getting them to bloom. Although they do flower, caladiums are grown for their colorful leaves. The flowers are inconspicuous and when grown as annuals, they may not have time to flower at all. Caladiums are wonderful bright spots in a shade garden. Grouped together, they can easily look like they are in bloom. Those with white in their leaves will catch every flicker of light and brighten any shady nook. Caladiums grow equally well in containers or in the ground. They pair nicely with ferns and other soft textured plants like astilbe, as well as with spiky leaved plants such as ornamental grasses and shade tolerant iris. Or plant them with coordinating colored blooms of fuchsia and Impatiens. It's hard to go wrong with caladiums. They are all low maintenance stunners. It really depends on your own personal preference of what colors you prefer. Here are a few varieties to check out. Caladium bicolor "White Christmas" - White leaves with green veins. You can purchase Caladiums already in leaf or you can start with the less expensive tubers. It's easier to tell what color the leaves will be if they are already in leaf, but most tubers come with a picture on the package. Tubers purchased from a nursery will have a knobby appearance. Each knob is actually an eye that will produce a leaf. Sometimes the tubers are a bit desiccated and the knobs are hard to spot, but they should re-hydrate and sprout. Fresh tubers ordered from growers will sprout the fastest. It can be confusing determining which end of the tuber is up because the roots grow from the same side as the leaves. Trust the tuber to know what to do, and bury it about 2 inches deep with the knobs facing up. the stem will find the sun. When potting, start them in a damp peat/soil mix. Caladiums like a slightly acid soil pH (5.5 - 6.2). Once they sprout, move into indirect light. To start caladiums indoors for outdoor planting, pot the tubers about 4 - 6 weeks before your last frost date. Wait until the soil warms to plant outdoors. Peat pots will make transplanting easier on the plants. Winter Care in Cold Zones: If grown outdoors in a cold climate, they can either be considered annuals or you will need to dig and store the tubers over winter. Do not wait for them to be hit by frost. Division: You can divide your Caladium tubers in the spring, to create more plants. Cut the tuber into sections that each contains at least one eye or knob and pot or plant as normal. Houseplant Care: When growing Caladiums as houseplants, water whenever the soil feels dry and feed monthly. Begin watering less in autumn, as plants naturally go dormant and stop growing. Although Caladiums are carefree growers, they can be subject to the following problems if growing conditions are not ideal. Indoor plants should be monitored for aphids and spider mites.